The United Nations Human Rights Council resolution argues "such measures prevent the full realization of economic and social development of nations. 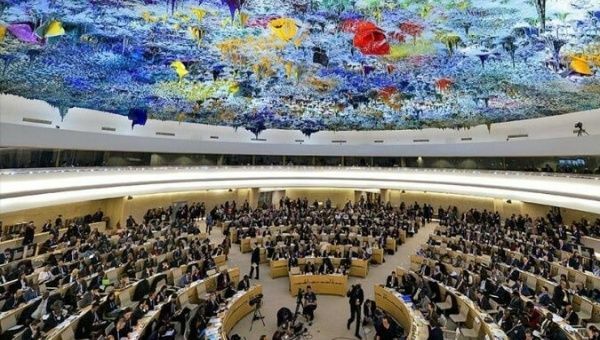 "The United Nations Human Rights Council (OHCHR ) has adopted a resolution proposed by the Movement of Non-Aligned Countries (NAM) condemning economic sanctions against Venezuela by the United States, Canada, the European Union and their allies. The document, put forward at the OHCHR meeting in Geneva, Switzerland, on Friday, urged "states to refrain from imposing unilateral coercive measures (and) condemn(s) the continued unilateral application and enforcement by certain powers of such measures as tools of political or economic pressure," reminding all states that "such measures prevent the full realization of economic and social development of nations." The resolution acknowledges Venezuela's position: economic sanctions "disproportionately" affect "the poor and most vulnerable classes," threatening the realization of human rights. Rather than the application of unilateral coercive measures, which are against international law, the resolution urges states "to resolve their differences through dialogue and peaceful relations." Last week, the United States imposed a new round of sanctions against Venezuela, this time against the new cryptocurrency launched by the Bolivarian Republic, known as the Petro. The sanctions target all transactions "by a U.S. person or within the U.S. with any digital currency" issued by the Venezuelan government. The Petro was adopted by Nicolas Maduro's government to bypass the financial blockade the United States and its allies has imposed on Venezuela, limiting its capacity to import goods. The Human Rights Council, meanwhile, said the measures "threaten the sovereignty of states... with a view to preventing these countries from exercising their right to decide, of their own free will, their own political, economic and social systems."